Las plataformas de Mac y Windows son distintas, y por tanto las características de la versión Win y Mac difieren en algunos aspectos, resolviendo probvlemas específicos de cada plataforma. Collaborate with anyone, regardless of what kind of computer they’re using. We’ve updated our screen recording file format, so you can pass screen recordings freely between Camtasia Studio and Camtasia for Mac. Using a single file format enables you to send a recording from one platform to the other effortlessly, including all the meta data, such as cursor effects and smart focus. Camtasia’s new Google Drive integration lets you upload your videos into Google Drive to give your viewers access from any web browser or mobile device. You can also import files into Camtasia instantly from Google Drive. TechSmith Fuse, our new mobile app, makes it simple to get exactly what you need from your devices into your projects. Send your photos and videos straight from your mobile device into Camtasia’s media bin. Then, use the editing power in Camtasia to create custom, shareable videos. Construct more engaging videos faster with multiple video and audio tracks. Record high-quality videos in no time with Camtasia Studio’s advanced screen recorder. Whether you’re recording HD video, a PowerPoint presentation, or a video game, you’ll get smooth playback – that’s blazing fast too! Easily import HD video, photos, music, and more to create unique videos that stand out. Import existing videos you have for quick editing, and add images or your favorite song to enhance your videos or make a presentation your own. Put yourself in your videos. Superimpose yourself into your videos, and make it appear as though you’re right in the action. Also known as chroma key or the green screen effect, Remove a Color helps you create more professional videos without having to be a video pro. Use the crop tool to show your viewers exactly what you want them to see and nothing you don’t. Stitch clips together to avoid having to reapply visual effects multiple times. And you can also copy an effect to quickly apply it to numerous clips – saving you time and improving your editing workflow! Make your videos pop with enticing visual effects. Insert cursor effects, apply shadows, colorize objects, add borders, or call attention to important details with TechSmith’s SmartFocus to give your videos a polished look. Easily add transitions to keep your viewers intrigued, use Clip Speed to make your videos the perfect length, and hide sensitive information with the blur tool. Share your videos with anyone, anywhere. Providing you online non-downloadable internet based software applications for your mobile devices and your personal computers for use in connection with delivering interactive digital videos in a FLASH and HTML5 viewer environment. Produce the exact video you want. Be confident that you’re choosing the right production setting for your videos with Camtasia Studio’s easy-to-use production wizard. With simplified presets, you’ll be able to easily decide which production setting is best for the type of video you’ve created. Send the videos you produce in Camtasia Studio straight to YouTube or our free hosting site, Screencast.com, which gives you the hyperlink and embed code needed to share your videos via email, tweet, blog post, and more. Camtasia Studio’s expansive sharing capabilities allow your viewers to watch your content anywhere, on nearly any device. Record anything on your screen. Fire up the application, webpage, or Keynote presentation that you want to appear in your screencast video, and record everything that happens on your screen. 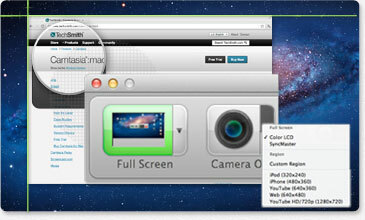 Camtasia for Mac’s flexible recording options give you the freedom to capture full screen, window, or region. Call attention to the important details in your video automatically. SmartFocus analyzes the position of your mouse cursor, which windows are active, when text is entered, and automatically predicts the best spots to zoom into on your video. The freeze region feature in Camtasia for Mac 2.4 allows you to get rid of any unwanted pop-ups or alerts that appear on your screen during a recording. Use it to create professional and informational videos without distractions or revealing personal information. Instead of re-recording your entire presentation, freeze region is a quick fix to get professional results. It’s easier than ever to lengthen individual frames of a video and give yourself more time to highlight specific points of interest…or to simply add more time for narration. Make videos the right length. Simply drag and drop the Clip Speed effect onto your timeline to speed up or slow down your videos to the exact length you need. With Clip Speed you can easily lengthen or shorten your clips to match narration without it changing the pitch of your audio – saving you time and frustration! Give your video a less mechanical feel by changing the way your callouts or animations transition into place. By enabling easing, you can give your callouts or animations a subtle decline in speed before coming to a final stop. Safely edit only the tracks you are working on, while locked tracks remain unaffected from accidental changes. When you want tracks to have muted audio or hidden visuals, simply turn them off. Create different versions of your video in seconds! Brighten up your video with the new integrated color picker, which includes eight pre-set colors, and the option to match the color of your callouts to any color in your video. Put yourself in your video! Integrate yourself or others directly into your videos – making it appear as though you’re right in the action of your videos. Also known as chroma key, the green screen effect allows you to create more professional and engaging videos. Use Spotlight and Mask FX to easily focus viewer attention to specific actions in your videos. Spotlight FX casts a light source across your media, and the Mask FX allows you to hide your screen, revealing only specific points of interest. a quick and simple tilt effect to both your webcam and screen recording. 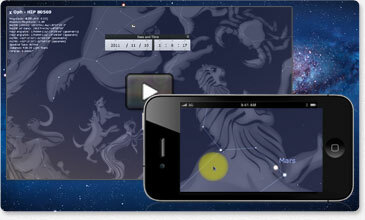 All you have to do is drag and drop to add the effect. And it’s just as easy to restore your video back to its original size. Call out or hide information. Easily add sketch motion callouts, speech bubbles, arrows, shapes, lines, and more to point out specific features throughout your video. Or, simply blur private information distracting parts in a video. Draw attention to mouse clicks by highlighting, magnifying, or spotlighting points of emphasis, or add keystroke callouts to automatically capture any keyboard shortcuts used during recording and show them off as a graphic in your video. Add any of these engaging effects to help your viewers follow along with what is happening onscreen. HotSpots let you create a link from anything in your video. Easily turn photos, text, graphics, and more into clickable hyperlinks that allow viewers to interact directly with your video content. Whether you're linking to a purchase page, download, or just additional content, HotSpots make it easy to keep your audience engaged. you upload and share on YouTube. Make your videos more accessible.